My first press was delivered in November 1998. 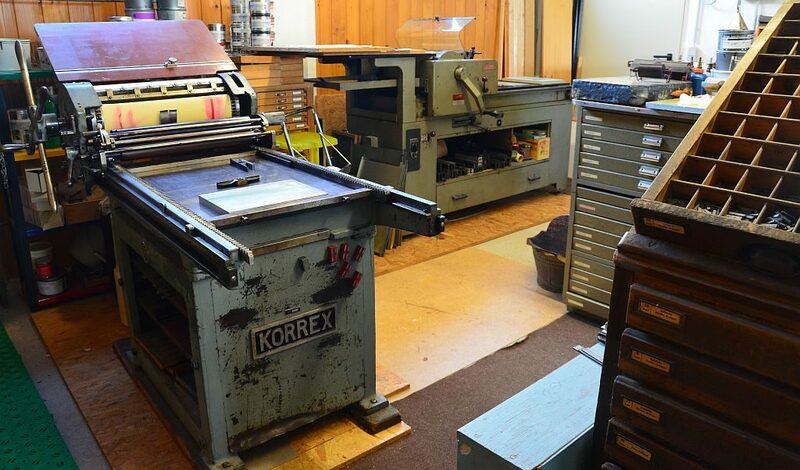 It was a KORREX Hannover, an entirely manual cylinder proofing press. This press is a rather unrelenting teacher, I can tell you. I very much treasure it. 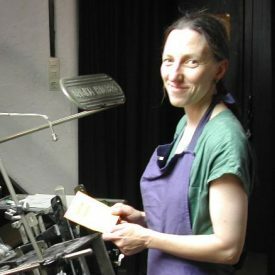 The press came with its standard inking unit (carriage). There are three rubber rollers, one of them with a pin on to which a handle can be put. 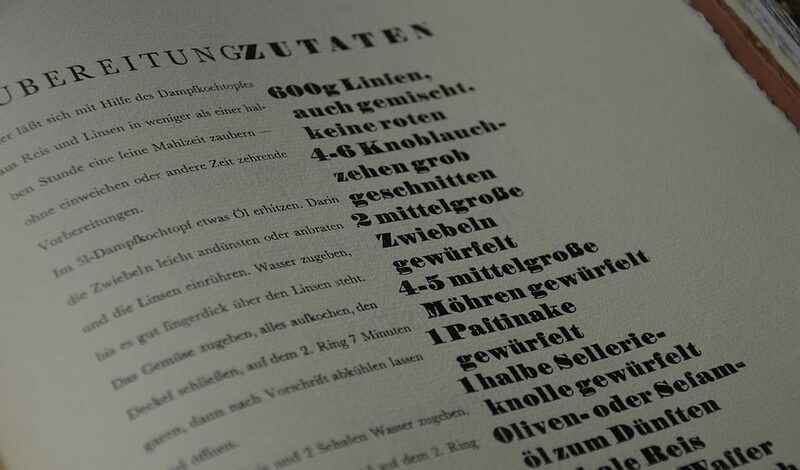 By turning this handle for quite some time the ink will be distributed evenly between all the rollers – the longer you turn, the better. As with many of these old tools and machinery they have been used, are worn, torn, even battered, and sometimes come with flaws or handicaps. Unfortunately with my press the rollers were not in their best working order and the pin on which the handle had to go was bent. 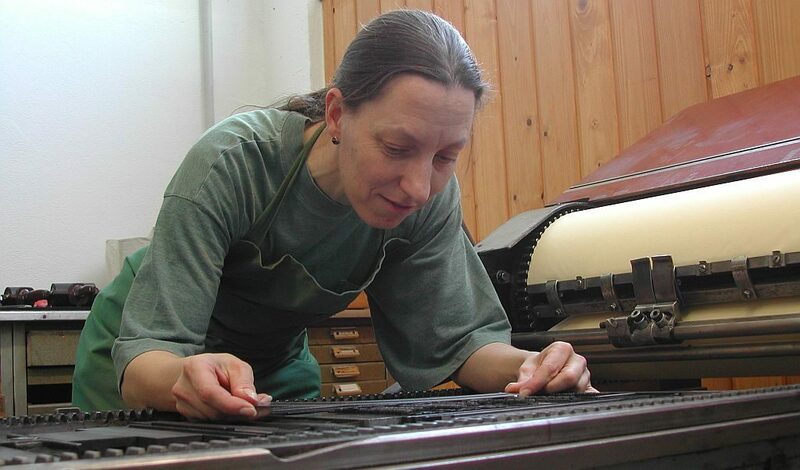 I simply could not afford to have it fixed for some years, which meant that whatever I wanted to print I would have to ink by hand. 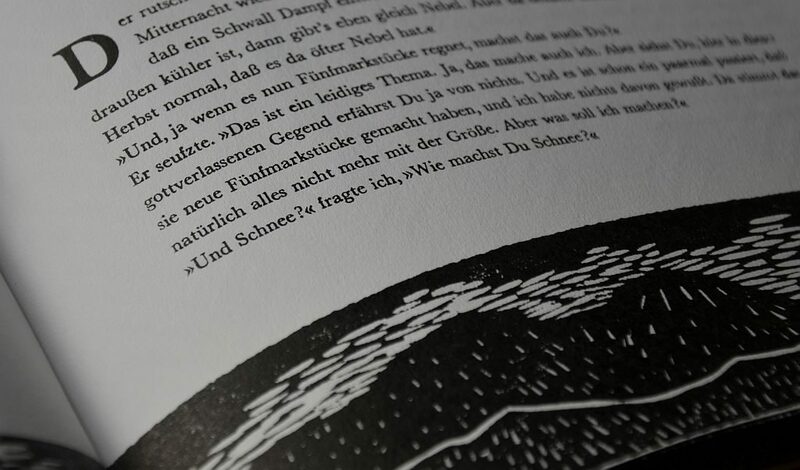 My first ever artist’s book „Der Kleine Niak“ (Little Niak) is a bedtime story I wrote for my goddaughter, inspired by a trip to the Swedish part of Lapland in the mid-1980s. I made four woodcuts to go with the text. The book was published in 2001 and sold out some years ago. 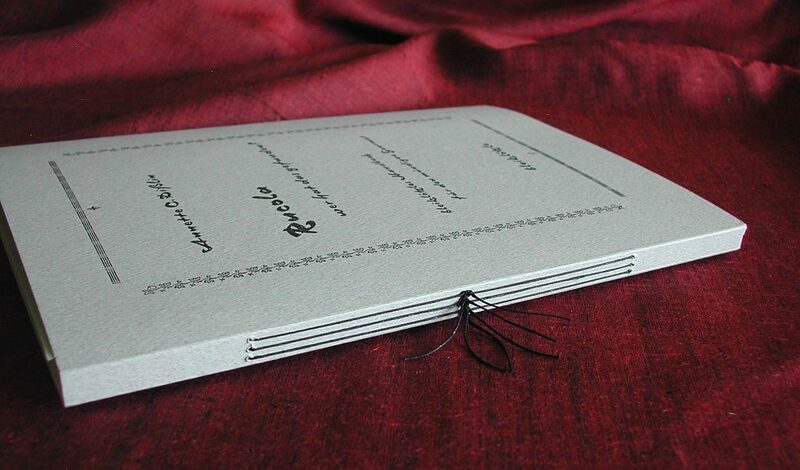 There were a few challenges printing the book. 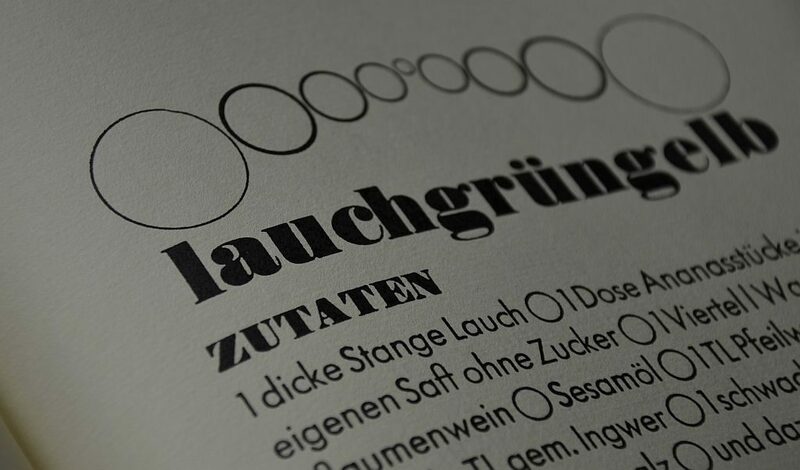 One of them was to get the 10 pt Baskerville inked up properly by using a hand roller. During the following years I printed a number of artist’s books: a philosophical cook book, a re-written Grimm’s fairy tale, a speech by Mirabeau on religious tolerance, a book on human rights. And all of them had to be inked by hand. 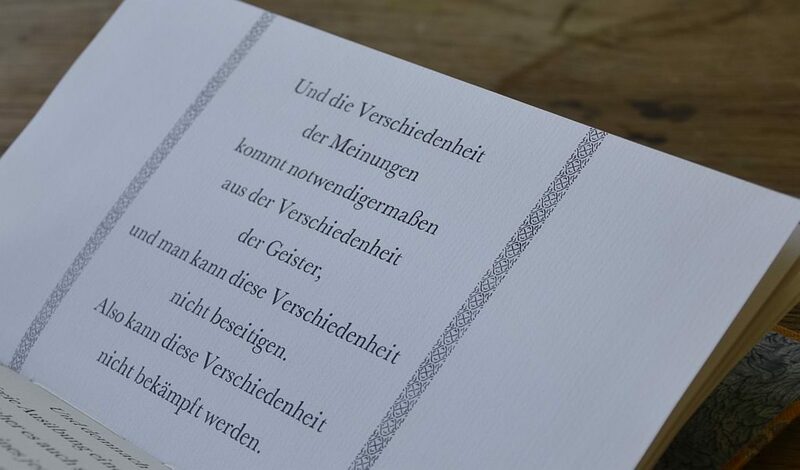 With printing the books, and all the broadsides, I gradually got the hang of it, but it will always remain a challenge with grades of metal type smaller than 16 pt. I had to be patient until the summer of 2006, when I finally could afford to have the inking unit fixed. 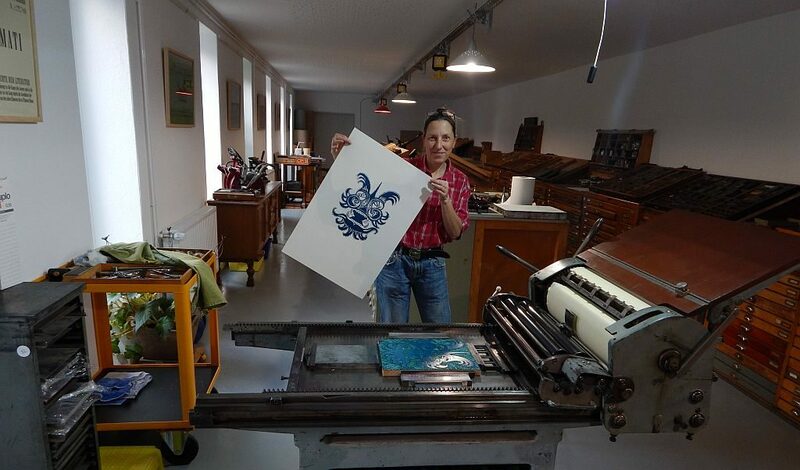 We travelled to the place where my KORREX press had been built in 1956: Max Simmel machine factory in Pforzheim. The people there were ever so helpful, back then it was still a family business. The pin got fixed and they sent the rollers to be re-coated. A few weeks later they came back to me in good working order. 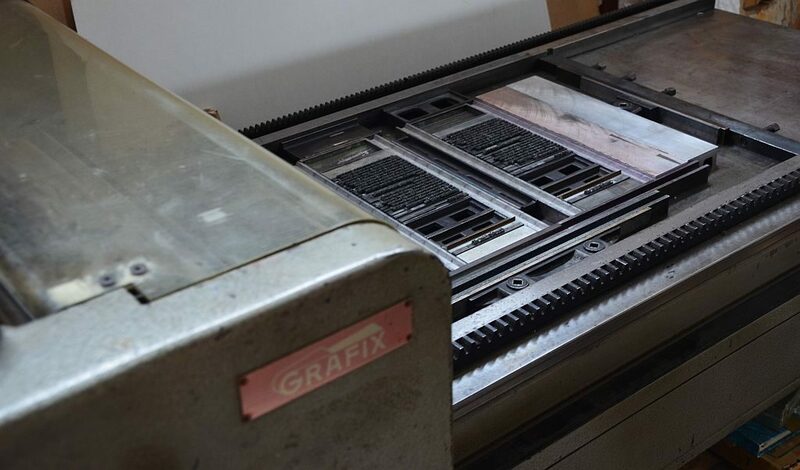 In early summer 2010 a GRAFIX proofing press joined the team, slightly smaller printing size than my KORREX, but with two interesting features: an adjustable press bed plus an electric inking unit. 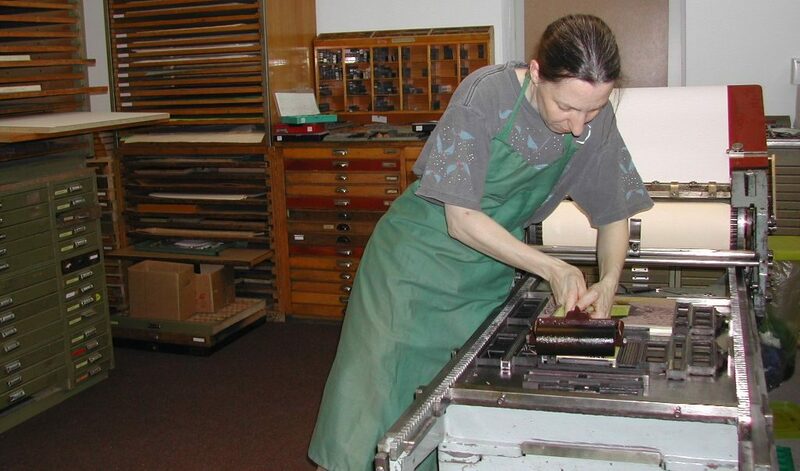 The compression cylinder still is manual giving the printmaker as much control of the process as possible. The press must have been built around 1964. It wants slightly more space as the Korrex Hannover, while the sheets have to be slightly smaller than the 50 x 70 cm my KORREX takes. My two proofing presses make a wonderful team. 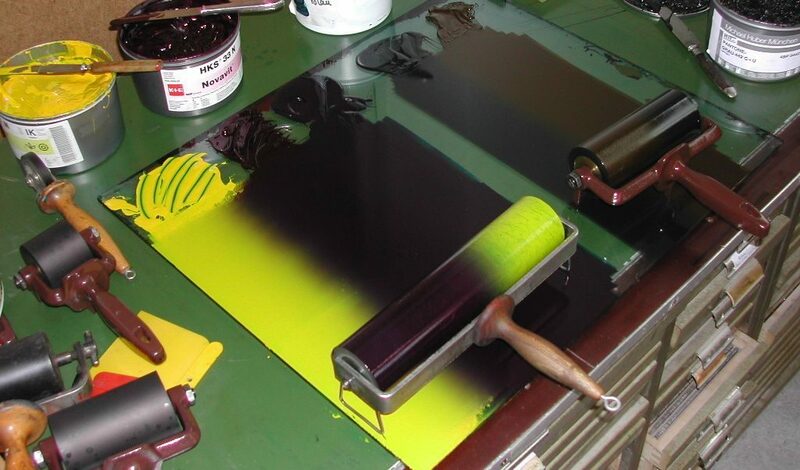 The KORREX is great for woodcuts, linoprints and postersized prints, while the GRAFIX is fantastic with text for books. 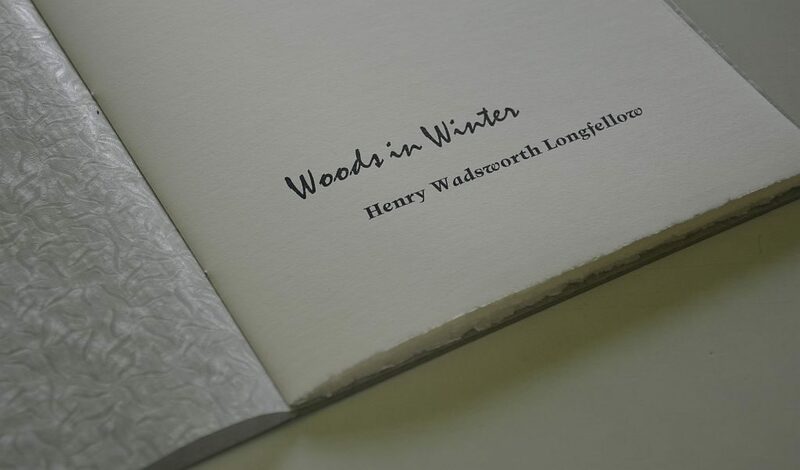 Amongst the artist’s books printed on the GRAFIX are „Woods in Winter“, a poem by Henry Wadsworth Longfellow (printed 2014), and „away“, a book about the various shapes and forms in which awayness may come, printed in 2015.